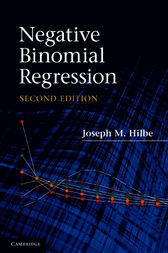 This second edition of Hilbe's Negative Binomial Regression is a substantial enhancement to the popular first edition. The only text devoted entirely to the negative binomial model and its many variations, nearly every model discussed in the literature is addressed. The theoretical and distributional background of each model is discussed, together with examples of their construction, application, interpretation and evaluation. Complete Stata and R codes are provided throughout the text, with additional code (plus SAS), derivations and data provided on the book's website. Written for the practising researcher, the text begins with an examination of risk and rate ratios, and of the estimating algorithms used to model count data. The book then gives an in-depth analysis of Poisson regression and an evaluation of the meaning and nature of overdispersion, followed by a comprehensive analysis of the negative binomial distribution and of its parameterizations into various models for evaluating count data.